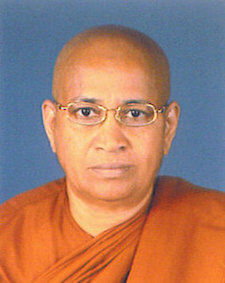 Bhikkhuni Dhammadinna is a meditation teacher from Samatha Vipassana Meditation Centre in Pallekelle, Kundasale, Sri Lanka . She is 65 years old. She became a nun 10 years ago, and has since led a very peaceful and happy life. Born to Buddhist parents and attending Buddhist schools she practiced ‘sila’ or virtue since her young days. At the age of 28 she got married and had three sons. Then she began to think of the Buddha’s teachings: “Who am I? Why was I born? What is the cause of suffering? How do I end suffering?” It was her good fortune to meet the late Venerable Amatha Gavesi when she was 50 years old. Under his guidance, she started to practice the Noble Eightfold Path of virtue, concentration, and wisdom by training her mind through tranquility and insight. She learned how one can eradicate the ten fetters that bind one to the wheel of existence: personality belief, skeptical doubt, clinging to mere rules and rituals, sensuous craving, ill will, craving for fine material existence, craving for immaterial existence, conceit, restlessness, and ignorance. One who is free from the first three fetters becomes a Sotapanna or stream winner, one who has entered the stream to Nibbana. One who overcomes the 4th and 5th fetters in their gross form is called a Sakadagami or once returner. One who is fully free of all of the first five fetters is called an Anagami or non-returner. One who is free of all ten fetters is called an Arahat, a perfectly holy one who has ended the cause of suffering and will not be reborn. At the Meditation Center she trains thirty to thirty-five persons at a time, male and female, who agree to spend two weeks as residential trainees. A group of nuns assist them when the need arises, explaining the four foundations of mindfulness individually to them. For the benefit of foreign students, last year she published a small booklet, The Path to Nibbana, briefly explaining the Buddha’s Dhamma and the principles of meditation she teaches at the Samatha Vipassana Meditation Center.